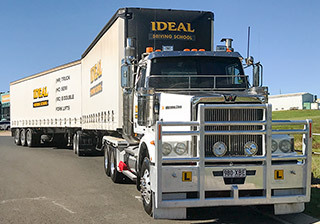 What sort of people use Ideal for driver training? There are many people (male and female) in the community who for various reasons need to have additional training or need to obtain a special driver's licence for their work. We pride ourselves on the scope of our services. These can range from training people with large motor homes or those with a need to have a forklift licence to someone wanting to make a career change and become a truck driver or those who wish to upgrade their skills and drive larger vehicles. Contact us now and ask us any of the questions you want answered. How long will it take get my licence? Your training requirements will vary depending on the type of vehicle and your previous driving experience. Please use the links below to choose the type of vehicle you wish to be trained in to get a better idea of the time required. The times quoted are indicative only. The number of lessons required will obviously be dependent on your current driving experience. We suggest you discuss this with us before you make decision to use Ideal. Can you get a licence in a one day course? The short answer is yes. However, we find many people cannot handle the intense training that is undertaken in one day. To avoid disappointment we strongly recommend a structured program. Yes, you can pay for your lessons as you go. Yes, we have MasterCard and Visa. Yes, cash payments are accepted and a receipt is issued at the time of payment. No, we do not as refusal may offend. All lessons must be paid for prior to a lesson commencing. What is the process if my employer is going to pay? Pre-arrange payment with our administration department. This can be through the raising of an official company order (which also names the pupil). Payment can be by cheque, credit card, or bank transfer. Only then can we make a booking. When can I go for a lesson? We work in with our students as we know many have day jobs so we can arrange an early morning start and in the summer fit in appointments after work and required work on a Saturday. Do you accompany me when I go for my licence? The testing officer will advise you immediately of your result. Yes, we charge for two hours. That is a 1 hour lesson and 1 hour truck hire. What sort of results does Ideal achieve? Our statistics show that we have a first time pass rate of between 90-95%. When you upgrade from an existing manual gear-box qualification to a higher licence class in an automatic truck, you retain your existing manual gear change qualification. The following examples should help you understand the process. You obtain the HR (Class B) qualification which is the same as manual car. You obtain the HR (Class B) qualification which is the same gear qualification as previously held in the Medium Rigid. You obtain the HC (Class B) qualification. Unrestricted, Heavy Rigid or Heavy Combination (previously completed in a Road Ranger gearbox): If you upgrade to the Heavy Combination or Multi-combination in the automatic gearbox truck you will retain the Road Ranger Full qualification and will be upgrading only your trailer towing qualifications to either HC or MC. If Queensland Transport have tested and given a person a certain gear qualification, he/she can upgrade and without needing to demonstrate gear changing again. This means a person can obtain a manual car licence and upgrade through all the truck qualifications without ever demonstrating gear-changing in a truck. Once I get my licence can I use it interstate? Provided you are a resident of Queensland you can use your licence anywhere in Australia. If you intend to move and live interstate you must make contact with the appropriate licensing authority to have your licence endorsed. You might (dependent on the state laws) have to sit for another exam. You are advised to undertake this research yourself. Will I drive a truck currently used by operators? 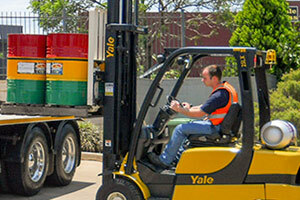 Yes, Ideal prides ourselves in our modern fleet of trucks and associated equipment. This means you are “job ready” as the trucks you are trained in are the ones used on the road today and meet industry requirements. Can you get me a job when I get my licence? We offer no guarantee of employment to anyone who has gained their licence. However many companies are enjoying the rewards of employing our graduates. 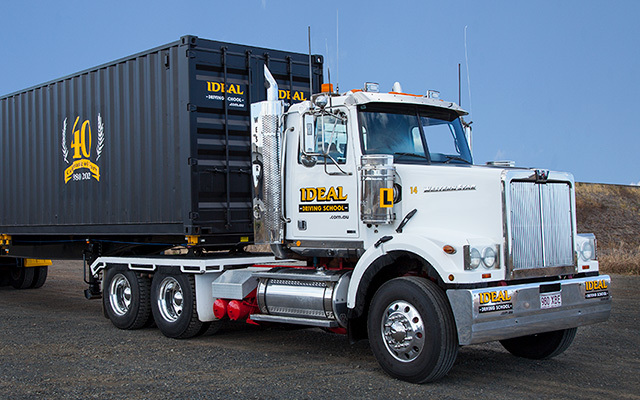 Companies are frequently calling on Ideal's services to recommend quality entry-level truck drivers for all applications from local deliveries in a medium rigid to operating road-trains long distance. Do you upgrade current licence holders? 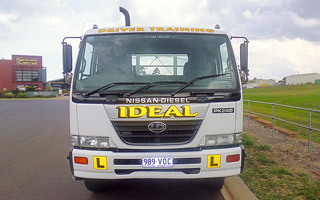 Yes, we provide advanced training for those drivers who wish to move to more complex vehicles. For example move from Medium Rigid to Heavy Rigid. However, there are rules and you are encouraged to select the link (below) that suits your needs to see what is required before you can by law be allowed to upgrade. Where can I see students testimonials?